Before I get into the details of how I made these super easy Sharpie Doodle Easter eggs, need to tell you the back story on how I’ve displayed them in my home. In all those years I have never asked why she did it. I just assumed that it was the thing to do especially when I came across similar egg adorned snake plants in our neighbors’ yards too! It did seem like a general decorative practice in that part of the world (Kerala, India). I’m as dumbfounded today as I was back then on the reasoning behind this practice! All I can think of is that, being in the tropics people are used to having flowers all around them all the time. The snake plant with just its variegated leaves was presumed to be rather “dull” that it needed an extra something. But why eggs? Still baffled! Anyways, whenever I see a snake plant it is the tall plant in my grandma’s yard that comes to mind, sporting egg shells on its leaves. So when I was making Easter Eggs, the first thought that crossed my mind was my Achamma and her snake plant! This one is an ode to my dear grandma. I was sure I had taken in process pictures but it looks I didn’t. 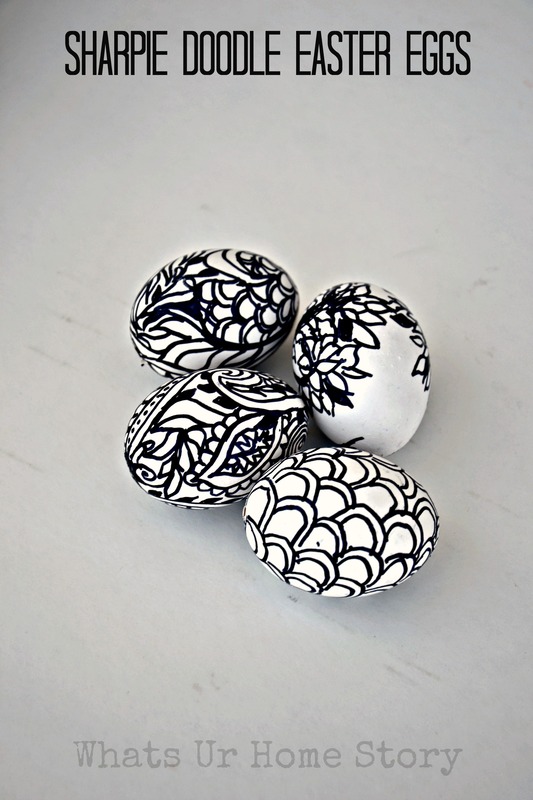 The process is super simple take a blown out egg and doodle away with a Sharpie to your heart’s content. You could seal the design with Mod Podge if you want but not necessary. For some of the shells I made the holes the I used to blow out the egg really large so that I could balance them over the leaves. For others I just poked a skewer into the shell and stuck the skewer into the snake plant’s pot. With a safety pin poke a hole on the top wider part of the egg. Move the pin around so that the size of the hole becomes slightly larger. Take the pin out and put a toothpick through the hole. Again move it around so that the hole gets bigger. Moving the tooth pick around will also break the yolk, which will make blowing the egg out easier later. Repeat Step 1 & 2 on the opposite narrower end. This time no need to make the hole as large as the top one. Place the egg over a bowl and blow through the top wider hole til you get all the contents out. Rinse the empty shell with water and dry. Once it is completely dry you craft with it. Now for the climax…….As soon as I took the first shot (was outside on the deck) the wind just swept all the eggs away and BAM, they crashed onto the deck into pieces. 🙁 My only consolation is that these are super easy to recreate. Rest assured we’ll be making more to jazz up our snake plant leaves. 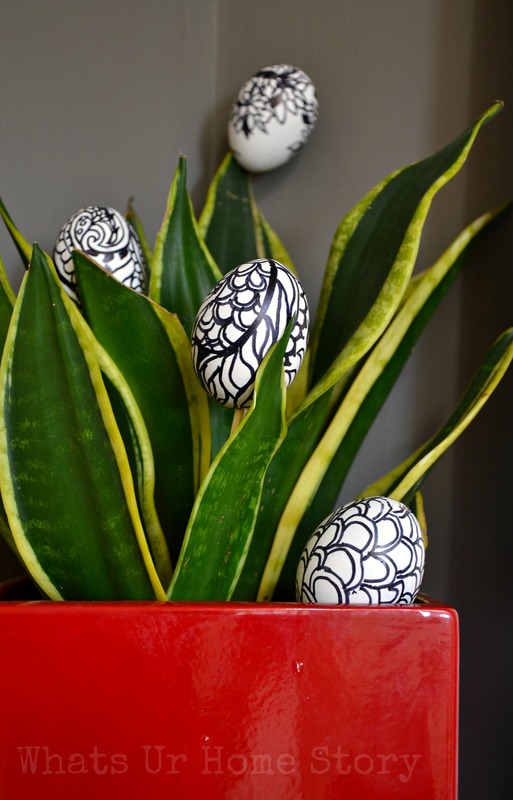 Have you heard of this practice of decorating snake plant leaves with eggs? Any idea why they do it? Have you had your pretty Easter eggs crack on you? 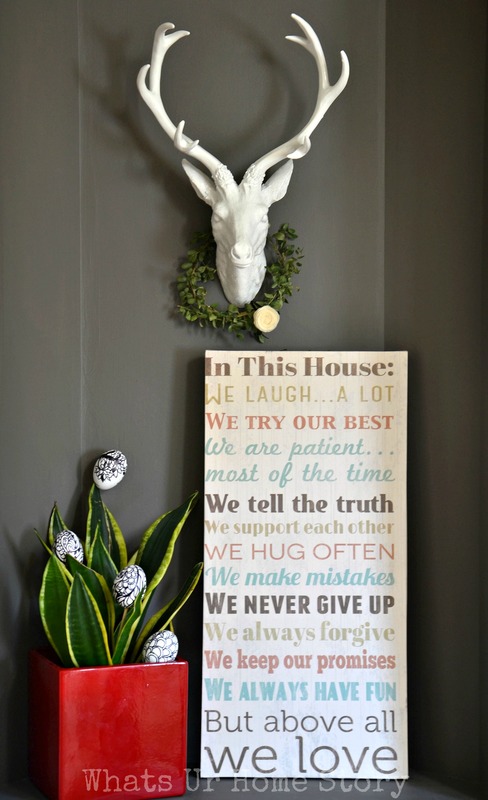 If you missed the Spring Home Tour post yesterday do check it out and don’t forget to check out the other bloggers showcasing their homes today and for the rest of the week. Thanks Elizabeth. These are super duper easy to make. I’m sure you’ll love making them. They are so detailed and pretty. I have to try these…I love the your beautiful display!! Thanks Michele. You should surely give it a try, they are super easy to make. LOL! I still see the egg shells in the pot on the soil in India along with used tea leaves. That’s because of the calcium and the other nutrients in the shells to sub for fertilizer. But on the leaves? Confused….. Thanks for the invite Alexis. Heading over and linking up right now. Oh, I just LOVE the easter eggs!!! So pretty! Thanks Christine. This is our first time making Easter eggs. The kiddos and I had so much fun. A Fun project to keep the kids engaged. Love it Vidya !!!! Also enjoyed the touches of spring in your home !!!! Thanks for the invite Karin. Just entered your Linky party. Thanks for hosting. So pretty. 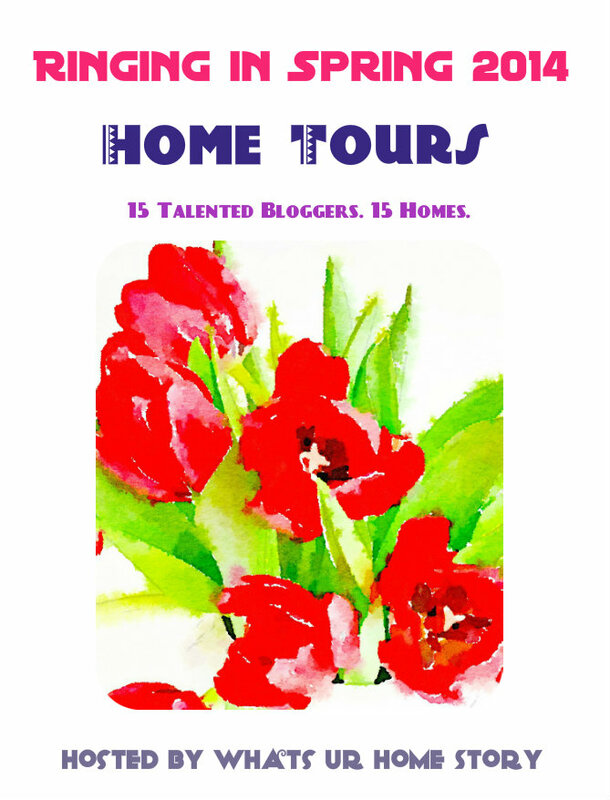 I came over from the Bloggertunities weekly share list. I’ll be sharing these on my Fri Faves post today. Thank you for the inspiration.